The president does something outrageous. As soon as you hear about it, you crank up your comedy gears, produce a great joke, and type it into Twitter. But before you hit the “tweet” button, you see someone else just made pretty much the same joke. You didn’t think of it first, and your joke, if you decided to post it at all, is not going viral. And it’s not just Trump that’s the problem. If there’s a royal wedding, a new marvel movie coming out, or something surprising happened at the super bowl, the pattern repeats itself: you can’t write the joke fast enough, and someone beats you to the punch. This didn’t used to be a problem. Five or ten years ago, you could write jokes at a leisurely pace and then Google the best ones. Most of the time, there would be no result. The only serious competition was late-night TV monologues or The Daily Show. And they came at night, so you had all day. Since then, the current-events satire space has been flooded. There’s a billion people on Facebook, 250 million people on Twitter, 80 million on Instagram, and a good portion of them are working hard every day to nail the funniest take on current events. Every day, each one of them could get lucky and come up with a great joke that goes viral. At the same time, professional writers on the talk shows and fake-news shows have Twitter feeds themselves, so their writers are targeting the same current-events. On top of all that, comedy celebrities, publications like The Onion, The New Yorker (thanks to Andy Borowitz), and countless others—the world’s highest-paid comedy minds—are all working diligently to best you every second of every day with their powerful distribution channels to push their hot take out to millions of fans. How can you possibly compete against such an onslaught? How can you do work that’s original when you’re drowning in a sea of voices? Here are 8 ways to do it. Maybe you think you’re already trying to tell a different joke and that’s the problem. But I’m not talking about foretelling what other people will say and then somehow magically coming up with something different. I’m suggesting waiting until everyone else has told their jokes, read as many of those jokes as you can, and then write yours. The Onion does this frequently, sitting back and watching all the other comedy outlets offer up their comedic take on a news story, including the late-night talk shows. Then, when the dust settles, The Onion calmly comes out with what is often the best and smartest take on the same issue—one that no one else had thought of. The formula for this strategy is simple: quantity is the key to quality. Writing hundreds of jokes to uncover one winner ferrets out the most high-quality jokes. You may not have time to write hundreds, but you can try. Write as many jokes as you can and choose the best one. That’s how The Onion got started. Speed is not as important as quality in the long run. And constraints are good for creativity. Knowing which jokes have been told and having to come up with something that hasn't been told is helpful because it gives you clear parameters. For a more systematic, targeted effort to find a unique take on a story, use the Divining Method (described in How to Write Funny) and go through all 11 Funny Filters. Come at the current event from different angle. Everyone will generally be coming at jokes from the same 4 or 5 angles. You have 11. Try every Funny Filter and leave no stone unturned. Most comedy writers won’t go this extra mile. They’ll go for the easy jokes. This is my favorite strategy. I don’t like fierce competition. I only want to play a comedy game I know I can win. I often bow out of crowded fields and walk the untrodden path in order to get noticed. The Onion did this in the early years, before it had a large staff to respond to current events. We would just bow out of competitive news stories, like the OJ trial, for example. The late-night talk shows were awash with OJ jokes, so we just avoided the topic altogether, for months. It didn’t hurt us. No one cared, They liked the jokes we were telling instead. It was counter-programming—a real diversion for audiences. Make jokes about secondary or tertiary stories in the news. Or make jokes about stories that aren’t in the news at all. The Onion still does this—making up stories out of whole cloth that simply employ current events settings, characters, or tropes. Rachel Lindberg Miller wrote this wonderful piece for Blaffo using this tactic. You can make relevant humor without referencing a story from the 24-hour news cycle. You can make a satirical point about something else in life: relationships, child-rearing, philosophy, religion, human nature, the way we eat, the way we communicate, the environment—whatever you want. Any of these subjects are just as current in people’s lives as whatever the president might have done today—perhaps even more so. If you’re dead set on commenting on current events, you can try tying a current event back onto any of the non-news topics above, making an Analogy, Reference, or Misplaced Focus joke that feels fresh. As long as you’re subtextually pointing out an injustice, a flaw in humanity, or an opinion you hold about what’s wrong with the world, you’re writing satire. And as long as you’re using one or more Funny Filters, you have a fighting chance to make that satire funny. Tired of producing comedy no one seems to notice? Lampoon people from the events of the day (the president, vice president, world leaders, celebrities, or other famous or infamous newsmakers) by ascribing character traits to them that are different from the go-to traits everyone else uses. This is one of the easiest ways to stay fresh because it has nearly endless possibilities. In general, comedy writers tend to be lazy about characterizing famous people. Donald Trump is almost always an angry, selfish toddler, Eric Trump is almost always the dummy archetype, Mike Pence is almost always a sanctimonious weirdo. Try out one of the myriad other character archetypes available. Or come up with new and bizarre character traits no one has thought to use before. The Onion, for example. decided to characterize Trump as deeply insecure and frightened. This feels fresh because it’s different from the character everyone else uses for him. Try using character irony, making newsmakers the opposite from what people expect, or see if you can find other traits that make sense. But make sure they stick. The traits either have to ring true or work as irony in order to succeed. You’ll have to study the figures a bit, put yourself in their skin, and let them try on some different hats. 5. Use a different format than everyone else. Experiment with different formats. In a different format, even the same or similar joke will be perceived by the audience as fresh. If you can combine a fresh take and a new format, your work will come of as strikingly original. Instead of a tweet, try to put your joke in the form of an online comment on somewhere like YouTube or Quora. Instead of making a YouTube video, go on Twitch. Parody different formats in prose, audio, or video. Remember that news isn’t the only format that can be parodied. There are so many others that have never (or rarely) been parodied: recipe blogs, weather reports, non-profit advocacy—you name it. What’s stopping you from experimenting with them? They’re just sitting there, waiting to be discovered, You can plug yourself right in and own a new format. Be the first. That’ll make you an original for sure. 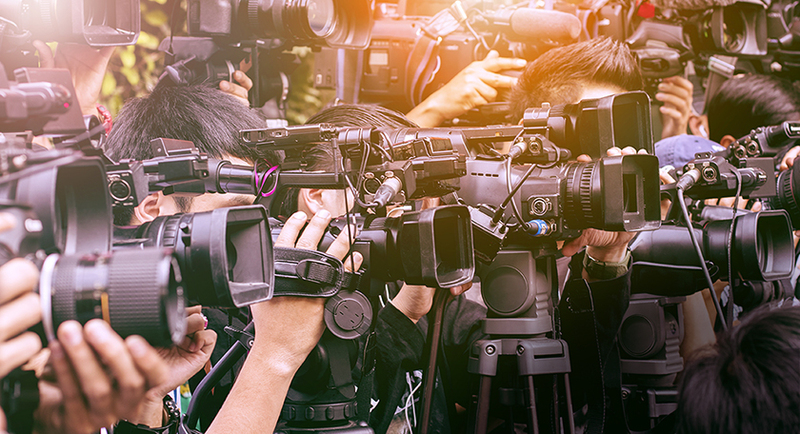 Could your take on current events be expressed in one of the 6 other media besides prose? Consider each one: TV/web video, audio/podcasting, the stage, movies, visual, street art. Read your jokes on video, in a podcast, or make a meme. You’ll probably find a bigger audience. The visual medium gets more views than text. Use street art to give people a wonderful surprise. You’re the only person who can tell a joke in your voice. Using many of the tactics above, you’ll begin to find and sharpen your unique voice. This is the best way to stand out. Once you have an identifiable comedy persona, you won’t have to compete with everyone else. Conner O’Malley is just one example of someone who's done this with topical, political humor and built a sizable following and a successful career. That’s it. Just don’t worry about it. Do what you can. 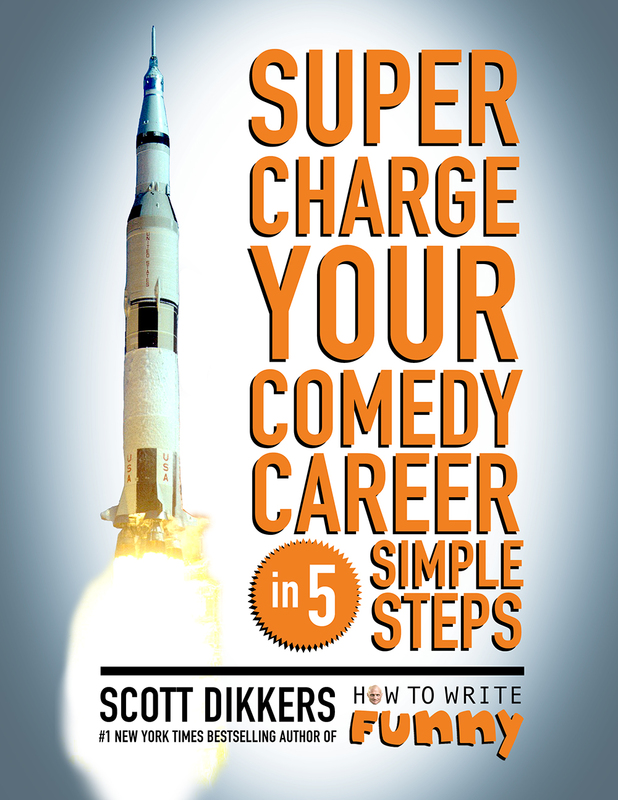 When you’re less stressed and less desperate, your comedy will be better. Audiences prefer performers who are calm and confident. Take your time and do your best work, and don’t worry about whether it’s similar to anyone else’s. If you come up with something that’s too similar to a joke someone else wrote, scrap it to avoid the appearance of unoriginality (or, at worst, theft), and move on. Take comfort that your joke was good enough to be thought up by someone else and was good enough to be found online. That’s validating. Try again next time. It takes a while to discover a comedy voice. Work on it diligently and play the long game. Next time the president does something outrageous, you don’t have to panic, at least as far as your comedy writing is concerned.